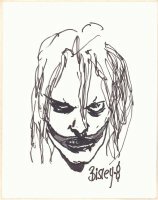 Simon Bisley (born March 4, 1962) is a British comics artist best known for his 1990s work on ABC Warriors, Lobo and Sláine. His style, reliant on paints, acrylics, inks and multiple-mediums, is strongly influenced by Frank Frazetta, Bill Sienkiewicz, Gustav Klimt, Salvador Dalí, Egon Schiele, and Richard Corben. 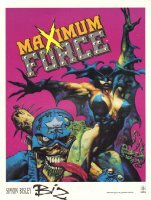 He also took inspiration from rock album covers and graffiti as well as traditional comics art. In turn he and his work has inspired various forms in media, including the Beast in the 2006 Doctor Who episode "The Satan Pit", and Simon Pegg's character graphic artist Tim Bisley on the Channel 4 sitcom Spaced.